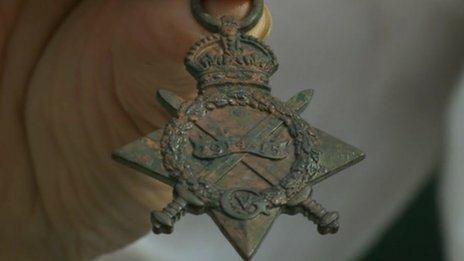 A couple who discovered a World War I medal in their garden are hoping to trace the descendants of Royal Navy sailor to whom it belonged, reports the BBC. Katie and Paul Roberts from Saxilby in Lincolnshire, found the 1914-15 Star as they dug a new flowerbed. With the help of a local history group they have discovered the medal belongs to a Sheffield man called Ernest Clarkson. The couple discovered Clarkson was born in Sheffield in 1890. He joined the armed forces in 1906 and served on HMS Bellerophon. He married a woman called Edith Tuxford with whom he had five children – Eric, Ethel, Alfred, Doria and Mabel. The Roberts believe the medal came to be in Saxilby via the Saxilby Canal, a popular venue for Sheffield residents who would come here to fish. This entry was posted in Events and tagged 1914-15 Star, 1916, Battle of Jutland, discoveries, Lincolnshire, Medals, Royal Navy, Saxilby, Sheffield. Bookmark the permalink.